With heartfelt greetings, I end my letter. Please, dear Lisi, tell me in your first letter what you have heard of my colleagues. 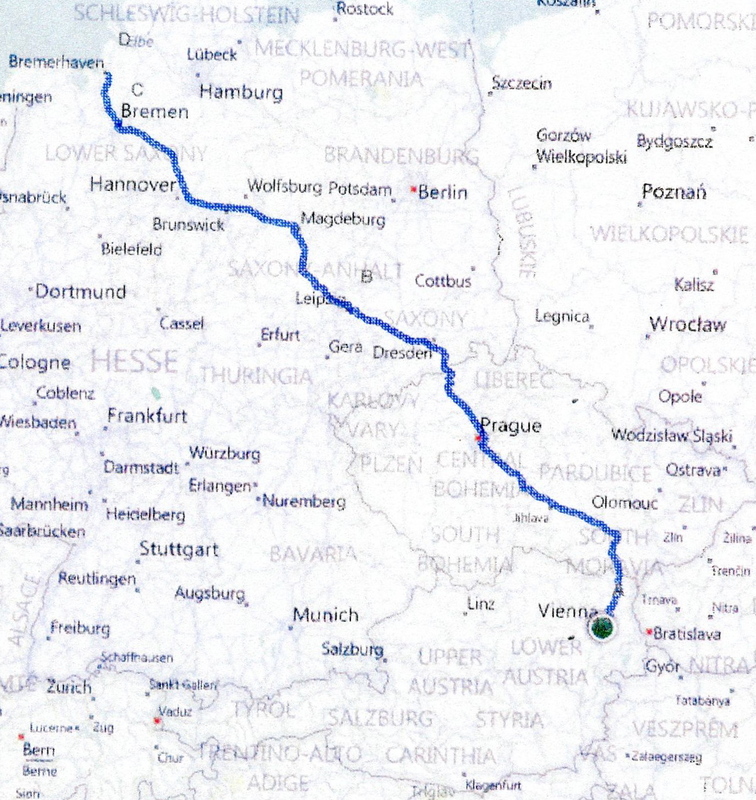 Making it successfully across the German border reduced the threat of Josef being sent back to Transylvania, but more threats to his dream of America still lay ahead. 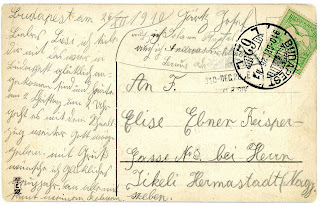 It was from Bremen he wrote the letter to Lisi from which I've been quoting portions. How he began that letter and what happened after its completion will be published on December 31, 2010. 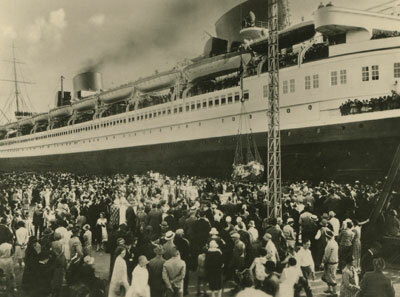 He, along with hundreds of others, still had hurdles to jump before boarding the ship to America. In the next post, scheduled for December 28th, we'll find out what happened. 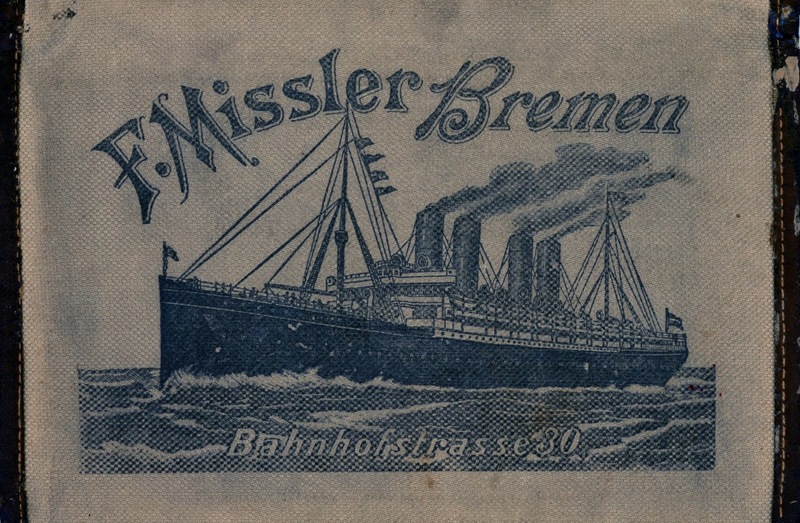 Missler Wallet with Josef's Gärtz's diary inside. but for years people thought it was the name of this "ghostship." Scroll down on the "Missler" link to learn more. I sometimes feel like a medium--you know--those people able to communicate with the dead. But in my case, they are speaking to me, and I’m channeling them back to life from across the last century. 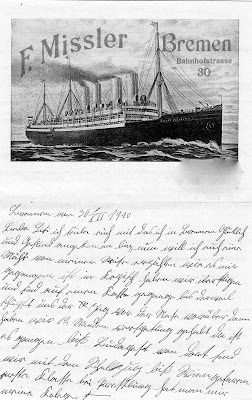 One of the most astounding discoveries I made just recently was Josef Gärtz’s diary of his trip to America. Several times I had seen the small, brown canvas Missler wallet inside of which my grandmother had written, “Dad’s Pass,” meaning his passport. 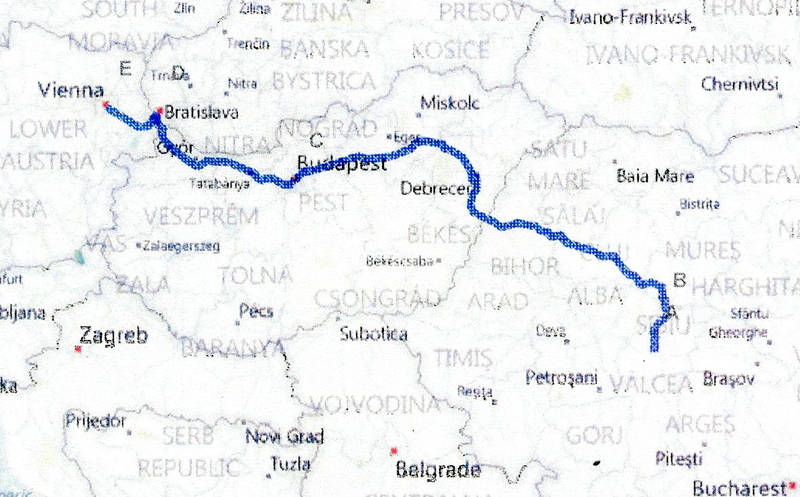 But inside was no passport--just printed pages in Hungarian and some strange writing in the back. I have so many documents, photos, and artifacts (twenty-five banker boxes full) that even after I’ve gone through them, I can come back to a box later and discover some small detail I had overlooked. My heart soared. 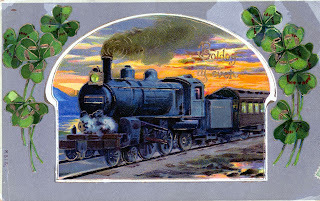 “The Trip to America!” What else could it be but a diary of his journey! 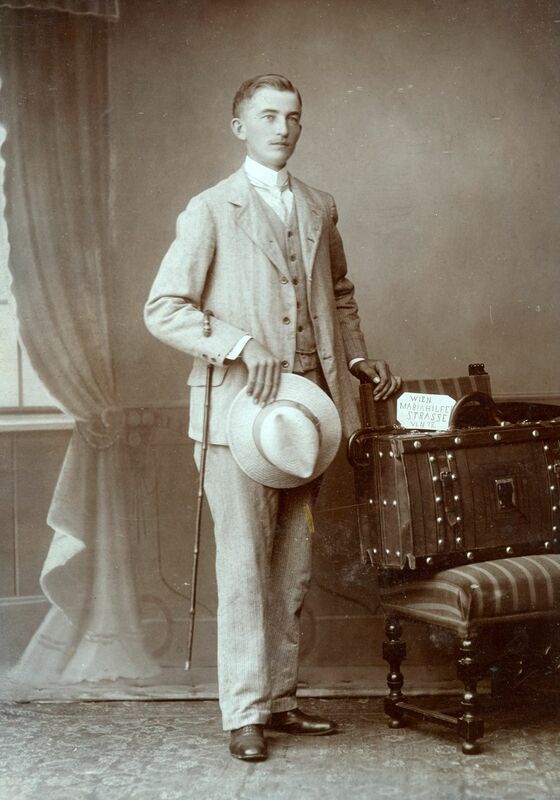 Even if I weren’t related to the author, I’d love to read a century-old diary of a young immigrant in order to discover what a he experienced on that risky, bold trip. I sent off a copy to Meta, and within a few weeks, Josef told me about his adventure in his own voice. Combined with the discovery of a letter and two postcards that he wrote to Lisi along the way, we can hear the fear, sorrow, and excitement that accompanied a twenty-one-year old about to leave behind everything familiar to strike out for an unknown future with only his optimism and confidence to carry him through. I wish you much happiness and Merry Christmas on this sad day and say many thanks for the farewell gift. And I certainly will take my little heartfelt remembrance of you and will carefully protect it. Please excuse me because it is now only as it is and not otherwise. [Perhaps he means, he just has to go, and it can’t be otherwise]. God be with you until we see each other again. Adieu, Adieu. Forget me not. Tomorrow, Christmas Eve, on the 100th anniversary of his departure, I'll post the beginning of his diary on the centennial of its writing. 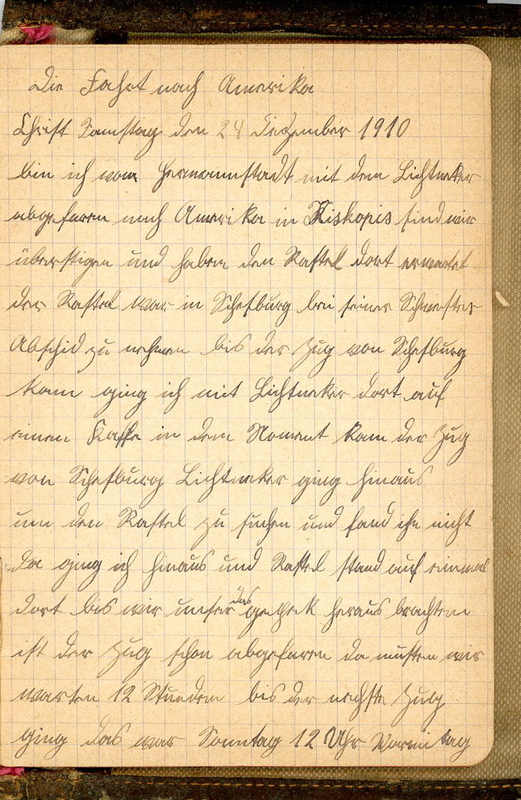 In 1910 Josef began a second book, this time the notebook in which I found his Military Draft notice handwritten on the first page. (See post, Drafted 100 Years Ago). 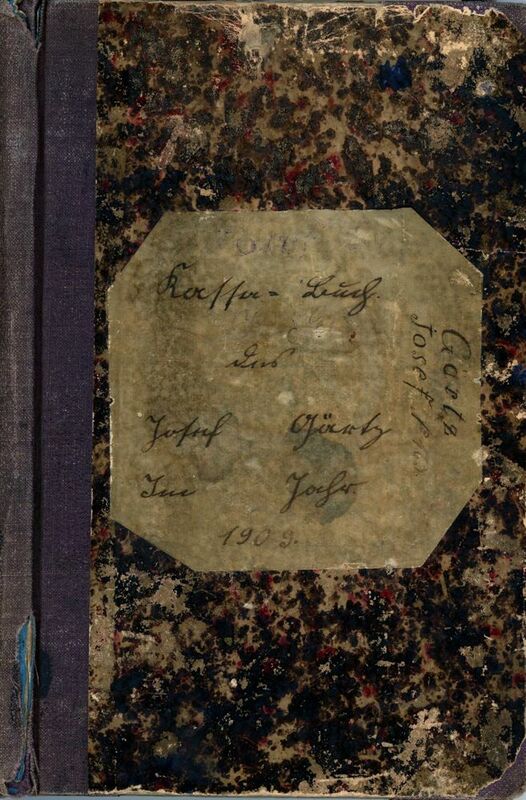 After making some inquiries with Transylvanian natives, the consensus at this time is that Josef probably copied the contents of the draft letter into this notebook to keep it handy. Such official notices were typically sent by mail. This book should not be used to teach or as a toy for children, but only for amusement during serious and hard times. It wasn’t because of an excess of money that I purchased this book, but rather unbearable boredom tempted me to do so. 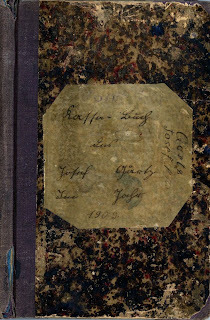 The moral and immoral contents from recited poems and songs which I entered into this book are a remembrance of the fantastic, fun trip I made to Vienna in the most wonderful years of my youth, from 19-21. This book is dear to me and whoever steals it is a thief, and whoever gives it back is a good fellow and whoever finds it, in case it is lost, will receive on delivery 5 Kronen. Please send it to my home Neppendorf Nr. 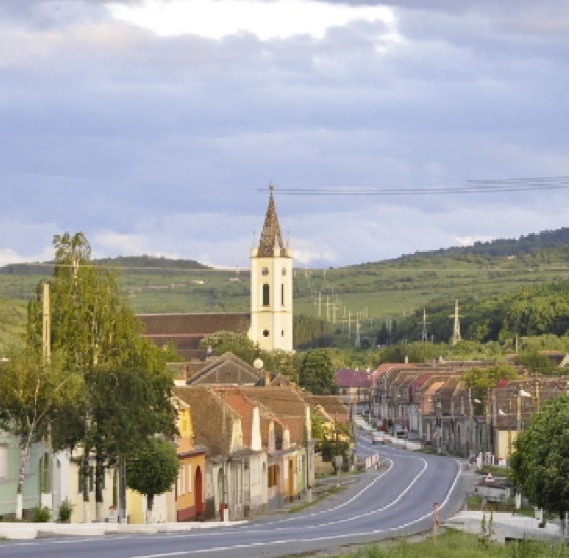 587 near Hermannstadt in Hungary. The notebook book comprises 57 pages with 95 numbered entries. Most of them are folksongs with multiple, numbered verses, but several are off-color jokes or anecdotes--the “immoral contents” he probably was referring to in his introduction. But he still had that draft notice hanging over his head, was in love with Lisi, and undoubtedly surrounded by buzz about America. 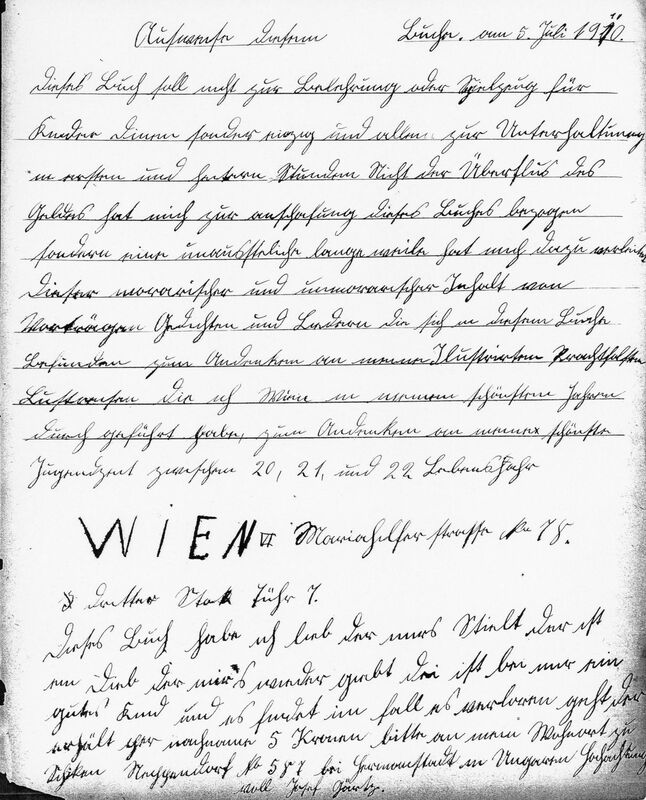 Did he respond to the draft summons on September 30, 1910, in Vienna, as ordered? I believe he must have at least registered, for he often relayed a story that he was told he was “too skinny” for the army, a trait that four years later, at the start of World War I, would have been meaningless. But later letters to him from Mrs. Jickeli indicate that he still had some sort of unfinished business with the military. Whatever the circumstance, in the following few months he had made up his mind. He was heading for America, and the next time he writes, he will record his harrowing trip, leaving Transylvania on Christmas Eve, 1910. 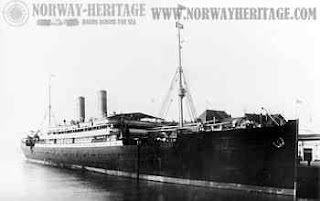 I’ll explain how I made the extraordinary discovery of his diary documenting his trip in my next post, and post the diary 100 years to the date after it was written, December 24, 1910. A little background may illuminate that statement. Like Lisi, he had lost a parent when very young. 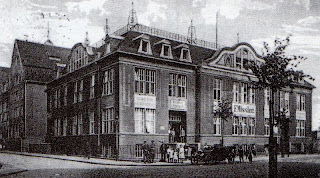 His father died when Josef was just four. We were told his widowed mother stood in a frigid stream, beating soldiers' clothes clean with rocks, in order to earn money to raise him and his sister. 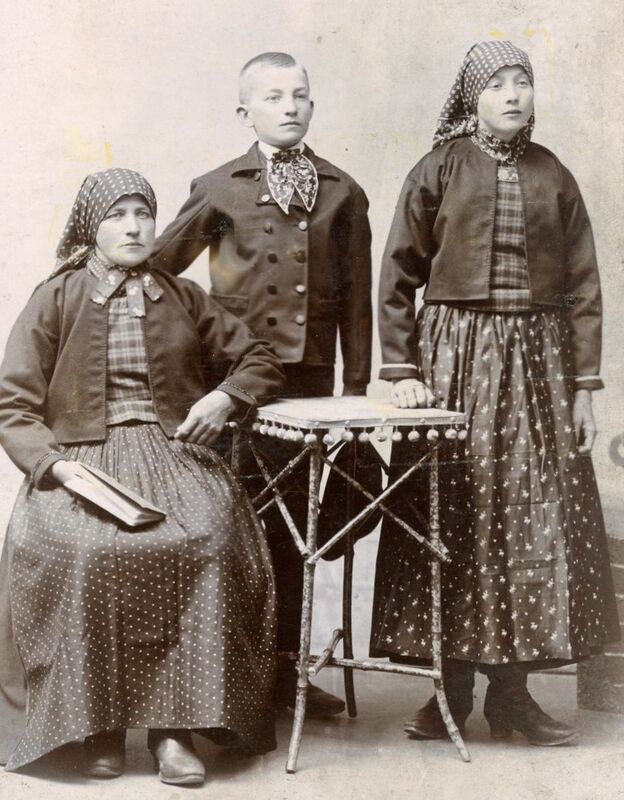 Here's the earliest photo I have of Josef with his mother and sister. He told us that at age six, he was tied onto the back of horse (his little legs couldn't reach the stirrups), guiding the beast to plow fields and earn some extra money for the family. 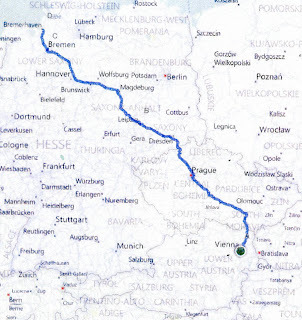 He went on to be a carpenter, but based on several notebooks he kept, employment near home must have been scarce as he often had to travel as far as Vienna (about 470 miles away) to find work. In 1909, at the age of twenty, he started making notes in a small book labeled “Kasse Buch,” literally a “cash book,” to keep track of earnings and expenditures, apparently for a trip to find work, first in Pressburg (the German name for Bratislava), where he spent two weeks, and then to Vienna. But he ends up finding a much more entertaining use for this book, according to Meta, a ninety-year old Siebenbürgen woman, now living in Germany, who took over Uli’s job of deciphering all the unrecognizable writing in my collection. 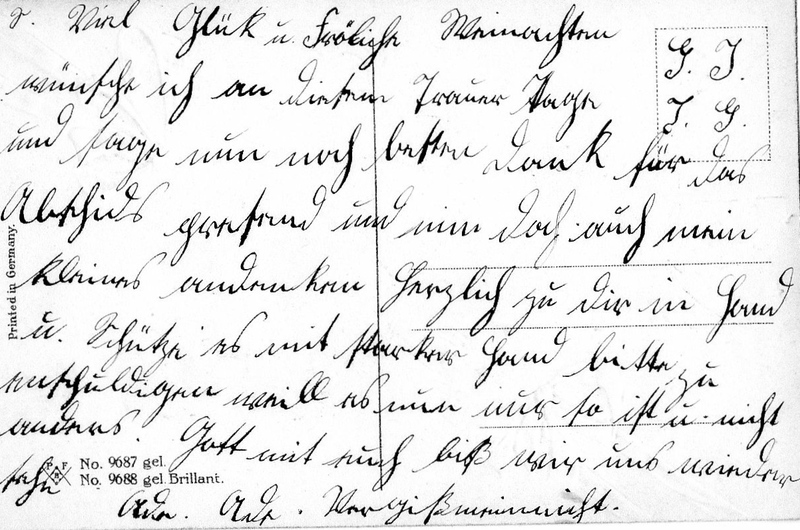 Born in 1920, Meta learned to write with the old German handwriting, and for more than a year, she has been my abiding Rosetta stone. Her intelligence, skill, and effort have already unlocked secrets trapped in more than forty inscrutable letters, diaries, and notebooks, shining a light on the lives of people whose first-hand experiences would otherwise have been lost forever. Not only has she decoded the writing, but she’s also made connections between events and often interpreted the intent behind the words and phrases that don’t easily translate to English. I sent Meta a copy of Josef's Kasse Buch, and she figured out its contents. 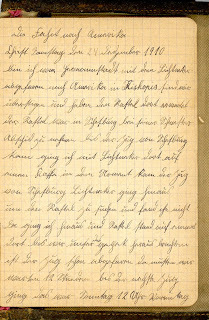 Josef did some ciphering (calculations are scribbled on the inside of the cover), but despite good intentions, Josef filled almost 50 pages of this “bookkeeping ledger” with the text from well-known folk, children, church and “Fatherland” songs. My grandparents knew hundreds of songs and often would spontaneously begin singing, in harmony no less. Imagine an era decades before radio existed--never mind television, computers, MP3, I-tunes, podcasts and Ipods. Imagine that all the music that entertained you was self-created. Everyone was his own sort of “American Idol." How thoroughly we have relegated our own musical creativity to “stars" and "celebrities!” This book, and another he created, are testament to the importance of singing in daily life -- and also of my grandfather's overriding cheerful approach to life. I'm not certain it was common for young men to write down the words to scores of songs. 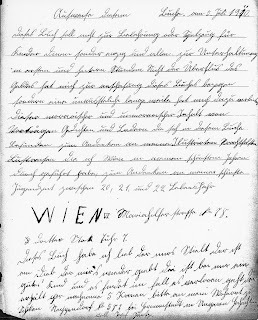 In 1910, Josef began a second book, this time the small notebook in which I found his Military Draft notice written on the first page (see Post, “Drafted 100 Years Ago" - November 22, 2010), commanding him to appear before the draft board on September 30, 1910. How did Josef make use of this second book -- and what would his response to his Draft notice be? Jickeli Household Help. Lisi Ebner seated 2nd from left. Mrs. Jickeli, center in black. This photo hung in my grandmother’s house for her entire life. The image has been carefully stylized to depict what women did in at the turn of the last century, but hidden on the back for 100 years was an inscription that gave insight into what they believed. Women’s work: peeling potatoes, mixing ingredients, grinding meat, baking (a large container labelled “Zucker” [sugar] sits on the table), cooking, spinning, knitting, washing, and ironing [two irons were used, one heating on a stove to be switched out with the the one in use when it cooled off]--all tasks necessary to keep a household running smoothly in the early 20th century. My grandmother, Lisi Ebner, is seated second from left, whisking up something in a bowl. In the center, dressed in black, is Berta Jickeli, the employer of the women in the photograph. It’s hard to see, but she’s holding knitting needles in her hands. My grandmother adored Mrs. Jickeli, as she always called her, and was devoted to her daughter, Lisbeth [LIZ-bett], the little girl at the washtub, for whom she was governess. Clearly impressed, Uli asked how my grandmother obtained such an excellent position. “She was smart, loyal, and had an abundance of focused energy,” was the answer I knew to be true. 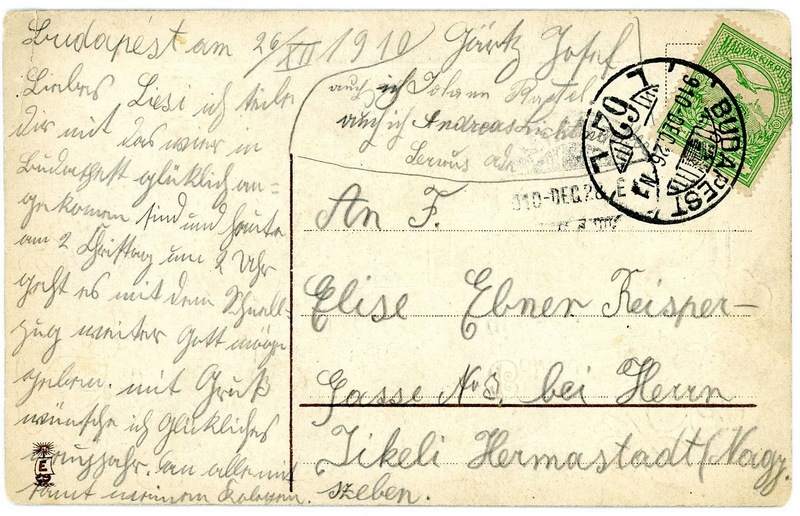 After she left for America, Lisi corresponded with Mrs. Jickeli for more that forty years and with Lisbeth for more than 60 years. She saved every letter, and through them I’ve come to understand the love they shared for each other and how much Mrs. Jickeli depended on Lisi’s intelligence and devotion. The letters are a chronicle of these European women's lives through the first half of the 20th Century and a first-person view of the devastation visited upon my grandparents' homeland in the aftermath of two wars. A few months ago I removed the photo from its frame to make a digital copy. On the back, hidden for 100 years, was an inscription and date! I discovered for the first time that this photo was a gift to Lisi from Mrs. Jickeli, inscribed with two verses (more like aphorisms) that undoubtedly were intended to help guide Lisi through life. (I later learned the verses were written by Georg Scherer, 1808-1909). Before you share it with others. Until you turn them into blessings. In other words, share your good ideas, and when life is hard, don’t give up. Endure! Fight against your troubles until you can find some good in them. It’s a philosophy that would serve my grandmother well as as she struggled to make a new life in a foreign country. 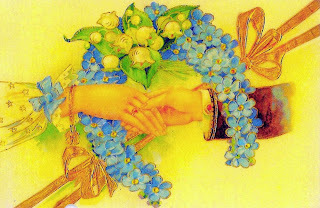 To my dear Lisi -- to remember many years of faithful work together. It was the first time I learned the date of this iconic photo, a century after it was taken. 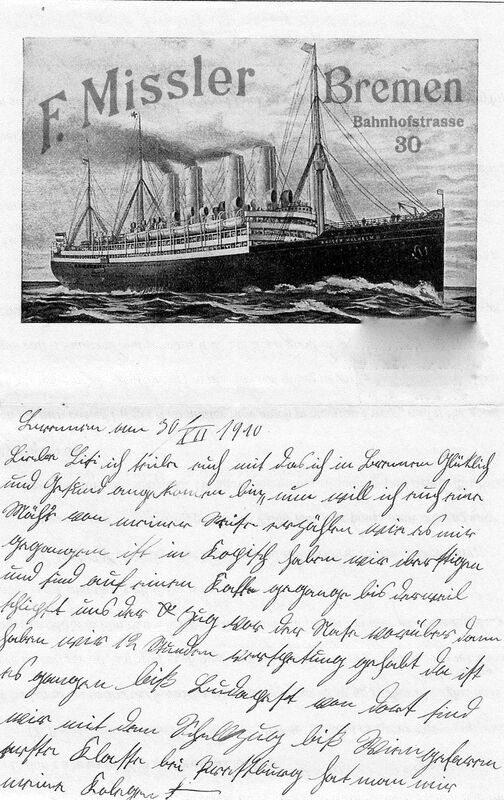 Perhaps Mrs. Jickeli realized that Josef would be leaving soon for America, that Lisi might soon follow, and gave her this photo as an early farewell gift. In fact, Josef would leave sooner than anyone expected, and he and Lisi would never spend another Christmas together in their homeland. The bottom of the Samuel Ebner page in the "Grosspold Family Book," shown above, records the marriage. Maria Schuster (née Wagner) was thirty-two when she and Samuel married. It may have had as much to do with practicality as love. Each had suffered the loss of a spouse. Each had children to raise. 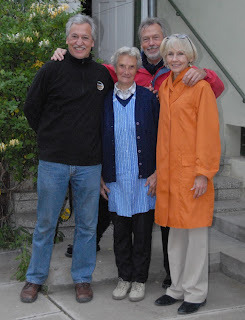 Joining together made sense, but Lisi, Samuel's daughter and my grandmother, felt abandoned a second time. She wanted her father all to herself and felt she was losing him to this unknown woman. The same dynamics that affect blended families today--children not accepting the new step-parent, resentment, parental loss still palpable--those feelings existed just as strongly 100 years ago. A neighbor took Lisi aside, we later heard, and in trying to convince her all was for the best, whispered, “A man needs a woman.” Twelve at the time, Lisi probably missed the sexual connotation of this remark, but never forgot it. Just like today, it probably took a lot of patience and love for Maria Schuster as the step-mom to win over Lisi, but she did--and Lisi came to love her new mother and sisters as her own. Difficult times and a strong community code that encouraged families to stay together probably helped, but I believe unconditional love was at the root of this blended family’s success. Two new children were born to Samuel and Maria: Theresia, known as Resi, in 1900 and Johan, called Hans, in 1904. 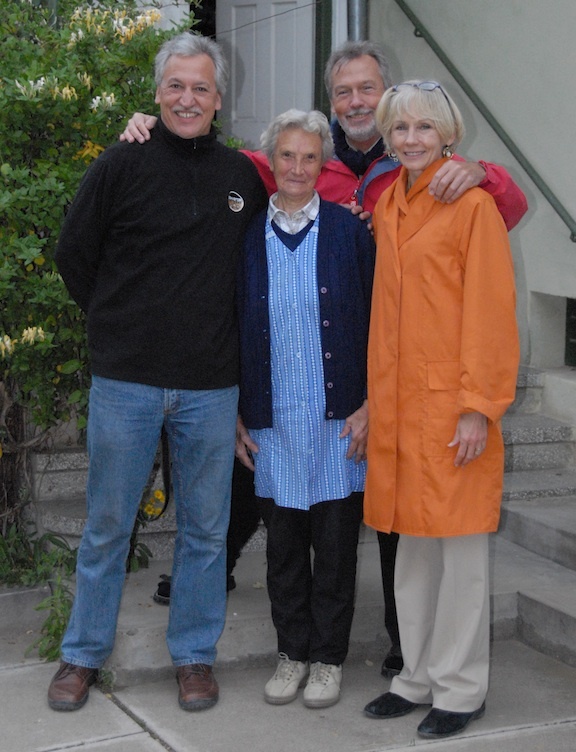 But the sisters brought into the marriage remained a mystery--until our family trip to Romania in 2007. In searching for my great-grandfather’s house in Grosspold, Pastor Meitert met a woman he wanted to introduce us to, Elisabeth Kirschlager. We were puzzled about her connection to our family--until she produced a familiar photograph--one I had puzzled over many times in our family collection because it was unlabeled. 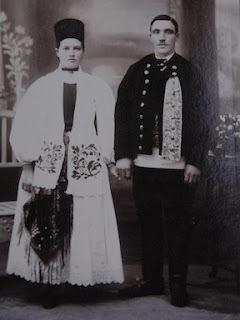 This is the photo Elisabeth Kirschlager showed us: her grandmother’s wedding photo. As we struggled through the language barrier, it suddenly became clear: Elisabeth Kirschlager’s grandmother was one of the daughters brought into the new marriage -- and grew up side by side with my grandmother. I spontaneously threw my arms around Elisabeth and cried. 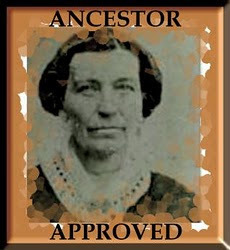 Though not related by blood, we shared a common family past through our grandmothers. It was a breakthrough in understanding the connection of family that goes beyond genes. Blended families know these bonds are as strong and true today as they were a century ago. My grandmother kept a photo of her hometown church tucked into the hymnbook she brought with her from Romania. No wonder. That church was more than just a place of worship. It was the repository of her entire community's history. That's why my brothers and I made the Grosspold Lutheran Church a crucial stop on our roots-finding mission to Transylvania/Siebenbürgen in 2007. But we had no idea just what we would discover. 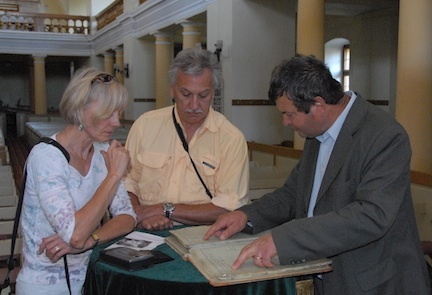 After finding the Ebner family house number (403) during our background research in Hermannstadt/Sibiu, we arranged to meet the Grosspold church’s minister, Pastor Meitert, who presented us with enormous volumes of ancient ledgers and narrowed down our grandmother’s family to this one. 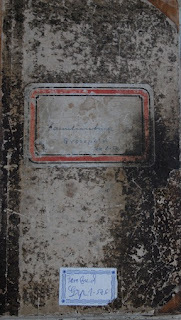 Centuries of handling is worn into its cover on which is handwritten: Familienbuch Grosspold [Grosspold Family Book]. Like churches throughout Europe, the Lutheran church in Grosspold encapsulated the lives of its parishioners in columns and dates maintained in "Family Books." A sense of life’s harsh calculus in 19th century Europe emerges from those stark numbers. Here’s page 283, photographed at the church. Under Samuel's name is "Elisabetha Ebner, geb. Eder" [née Eder], my grandmother's mother. The next three columns record the "year and date" of each family member's birth, marriage, and death. (I cropped out additional columns with little info to make viewing easier). 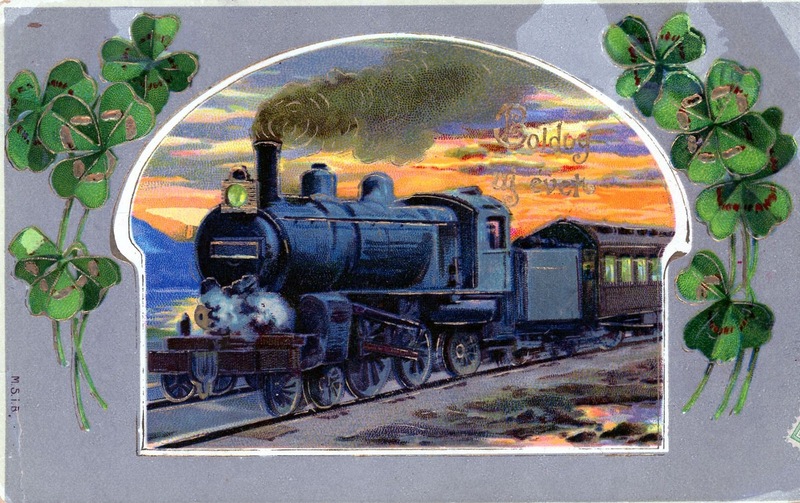 The entries show Samuel Ebner was born December 20, 1854, and married Lisi’s mother, Elisabetha Eder, on November 23, 1879. He was 24. Born September 3, 1863, Elisabetha was only 16. Their first child, Maria, arrived about two years later, February, 1882. What good news this book holds! I imagine Samuel and Elisabetha's thrill. But then the entries turn tragic. The next baby, born in December, 1883, was named Elisabetha, after her mother. It was winter. She died three and half weeks later. A little boy, Samuel, bearing his father’s name, was born in April,1886. The book records he died July 2, 1886, living only two months. Names were assigned to children over and over until they could stick. My grandmother was given the same name as her deceased sister, Elisabetha. But the book erroneously records her birth as July 30, 1886, impossible since baby Samuel was born three months prior to that date. The year should have been 1887. A good archaeologist has to be sure even recorded history makes sense! But it makes me wonder. Was the pastor pondering little Samuel’s birth and death dates when he absentmindedly entered the wrong year for my grandmother's birth? Only 23 when my grandmother was born, my great-grandmother had already suffered through the deaths of two children. But more heartache for the family was to come. 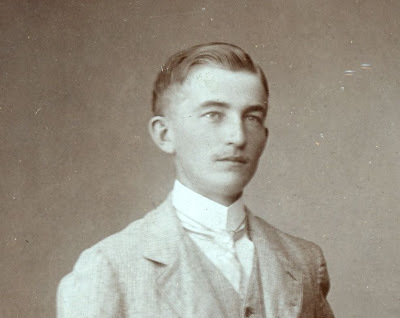 In May, 1890, little Johann was born. He lived one year. My grandmother would have been nearly three when her baby brother died. Her parents’ grief must have affected even a child so young, but she never spoke of it. She would have plenty of other losses to hold in her heart. 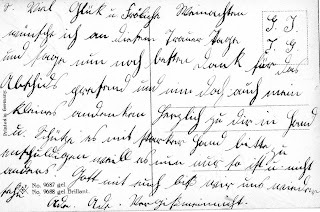 Elisabetha gave birth again in June, 1893, another little boy, again named Samuel. But his mother never got to see her only son live to grow up. Death bypassed Samuel -- for the time being -- and sought out his mother this go-around. On January 13, 1898, thirty-four-year-old Elisabetha succumbed to what Grandma later told us was pneumonia. The book doesn’t record the cause of death, but in an era prior to antibiotics, disease was the likely culprit for every death the Ebners endured. In this one family's ancient record, we see first-hand the kind of loss endured by virtually all families of the era. Left motherless, Lisi (my grandmother's most common nickname) clung ever more tightly to the father she adored. But then he, too, she felt, was taken from her. How what happened next spawned an amazing coincidence a century later.